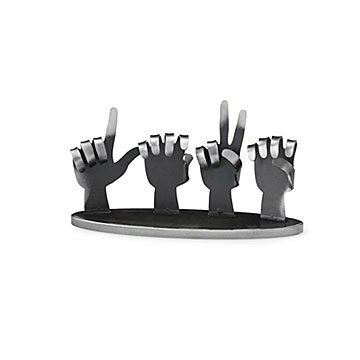 This desktop sculpture, made from handcrafted steel, spells out LOVE in American Sign Language. Did you know that each country has its own, unique sign language? That’s even true for countries that share an oral language, like the US, Canada, and England. Not only that, but sign language also has its own regional dialects, with specific words varying by state or even city to city. But any language in the world is at its best when expressing that most important human emotion—love. Artist Stephen Zawistowski was inspired by American Sign Language when creating this steel sculpture. Often, a hearing person’s first exposure to ASL is finger spelling, where each hand position represents a letter of the English alphabet. Stephen uses that touchstone as a bridge, spelling out L-O-V-E in a visual way that speaks to hearing and Deaf people alike. Made from handcrafted steel, the piece combines a contemporary edge with heartfelt emotion. Handmade in Jacksonville, North Carolina. Well made and as pictured and described. Truly perfect but would have liked an option for engraving. The love sign sits nicely on any normal size desk and does not take up much space. My mother in law is deaf and when I saw this I knew she would love it. It's very well made. I thought from the picture it would be big but looking at the dimensions I realized it is smaller than I thought which is perfect for displaying on a shelf or desk. I definitely recommend this as the perfect gift for that hard-to-buy-for person. Love the simplicity of the design, and am thrilled I can show my love for my daughter with a gift that's so meaningful to her. This was exactly what it said it was. My husband is in a new and demanding job; when things get overly stressful I wanted him to be able to see that I love him and he is doing this for us. It is the perfect size for a busy desk. When he he fostering a dog in his office, it can't be chewed. It is the perfect reminder that he is loved for all he does. Another plus is it is an attractive piece of art. Such a beautiful piece, we love it ! My wife absolutely loved it. It sits in a prominent place in her office now.